Sina Grace slides back into action with the resurrected Iceman solo series. Grace is this time joined by Nathan Stockman, but a few months off and a new creative partner hasn’t slowed this series down one bit. This five-issue miniseries picks up where the previous Iceman ongoing series left off but offers an easy entry for new readers. Bobby Drake has kept the emotional growth and maturation he underwent during the previous eleven issues. The plot, though, is something new, so no one should feel like they’re missing anything. That new story involves the Morlocks. Iceman discovers a missing person flier for one of the sewer-dwelling mutants. It's an unusual sight given the Morlock's isolationist tendencies. Sensing something is amiss, he calls the X-Men for backup and prepares to lead a team into the Morlock tunnels to investigate. That team ends up being only Bishop. Despite how much time Iceman and Bishop have spent fighting side by side on the X-Men, they’re still an odd couple at best. Grace and Bobby lean into and have a lot of fun with the buddy cop dynamic. Iceman tosses his jokes at his straight-faced partner throughout the entire issue. The dynamic pays off in more than gags. Grace makes sure that each character takes something away from their team up with the other. The dialogue sets a light-hearted tone that Stockman’s artwork and Federico Blee’s colors match and elevate. Stockman’s characters have an exaggerated style that wouldn’t be out of place in a cartoon, and Blee’s colors have a similar simple but evocative hue. Stockman excels at body language, bringing the characters alive in even quiet moments. 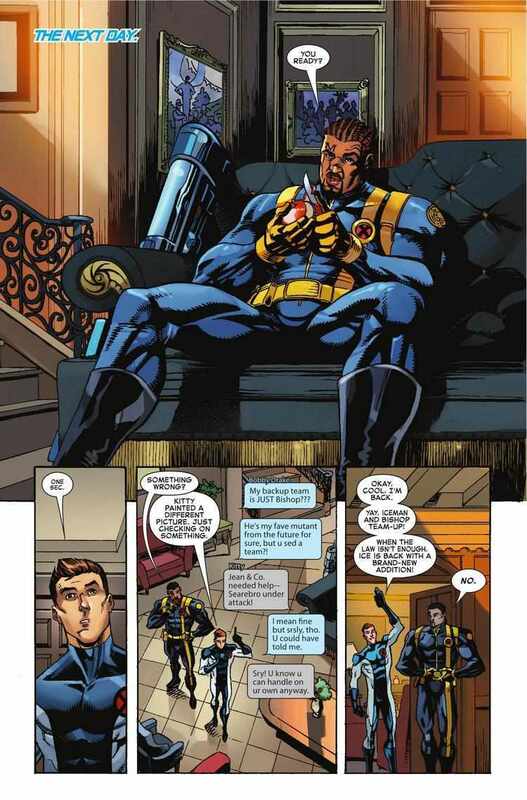 A scene where of Bishop sprawled on a couch and skinning an apple conveys everything readers need to know about his personality with a single shot. This talent helps elevate the action sequences as well. There are an enthusiasm and athleticism to Stockman’s fighters, and their powers, Bishop’s in particular, are accented well by Blee’s bright colors. While Iceman’s surface level is all humor and action, Grace layers in timely subtext the way he did with the original Iceman series. In this case, that subtext has to with tribal purity, cultural assimilation, and isolation. It’s an interesting concept to play with, taking Xavier’s philosophy off of its pedestal and putting it between the Morlocks and the Marauders. It’s a well-crafted book, but there are some excesses that may irk particular readers. Grace loves playing up Iceman’s dad-humor, so much so that he actually puts in a gag where someone makes him pay for it with a dad-joke jar. The borderline cringe-worthy jokes are all intentional and all work to varying degrees if taken as intended. It’d be understandable though if some felt they bordered on self-indulgent or too clever at times. Stockman has an exaggerated style, which works well for this book, but it does push the barriers of belief at times. Bishop, in particular, appears top-heavy on occasion. Again, this is intentional and works well on the whole. Yet, it sits close enough to the border between realistic and cartoonish that it could be a distraction for some readers. Even with these minor possible flaws in mind, Iceman #1 is a stellar return. Most impressive is how the issue is completely capable of standing alone, but also seeds an exciting story to come. Even a casual X-Men fan will recognize the deadliness of the threat behind this issue’s attempts to recreate the “Mutant Massacre.” Longtime X-Men fans, and fans of Iceman, in particular, will get something extra out of the last page reveal of who’s waiting for Bobby at home. 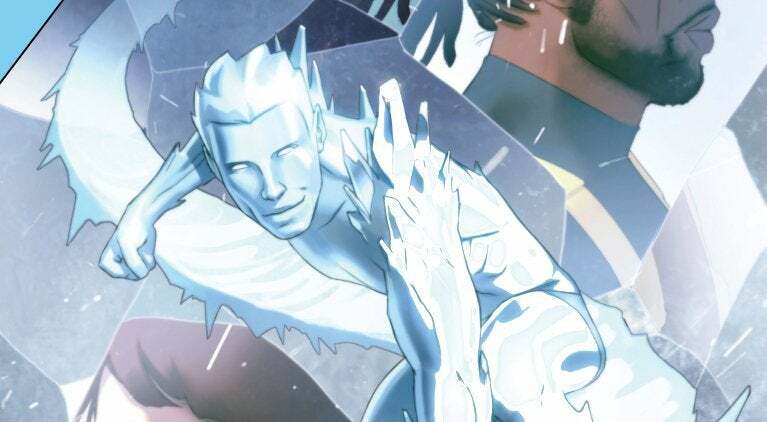 Iceman #1 is a triumphant return for an underappreciated series. The longer Sina Grace writes Bobby Drake, the more Iceman develops into a truly compelling, relatable leading man. Grace found the perfect artistic partners in Nathan Stockman and Frederico Blee. Here’s hoping Iceman gets more of the attention it deserves the second time around.